During a recent visit to Kingwood Center Gardens in Mansfield, I was treated to Angel Trumpets in bloom. These summer-fall bloomers make for spectacular late season WOW! For Ohio growers, these are tropical and frost tender. They would need to be brought in each winter as Kingwood Center does, however a big pot and some TLC might be worth it for these show-stoppers. Angel’s Trumpets, Brugmansia spp., are woody shrubs or small trees with large pendulous flowers. These huge trumpet-shaped flowers in total can be a foot long and come in white, yellow, orange, red or peach in single or double flowers. The flowers dangle from the branches like bells and have a sweet smell that is said to be even stronger at night. They are native to Ecuador, Peru, and Columbia growing in the slopes of the Andes Mountains. In gardens, they need to be kept moist and watered in well-drained fertile soil. So, watch those pots when they dry out in high heat. You can also plant them in the ground but they need protected or even dug out for winter in Ohio. They do well in full to partial sun and some have reported success keeping them indoors as a house plant as well. Reported problems include mites and tomato or tobacco hornworm as these are members of the solanaceae family along with tomatoes! These trumpets are not all angelic however. All parts of the plant are poisonous if consumed and therefore are claimed to be (knock on wood) deer tolerant. But do keep away from children and pets. As a tropical plant, they need some extra care for Ohio weather, but their WOW may certainly be worth it. 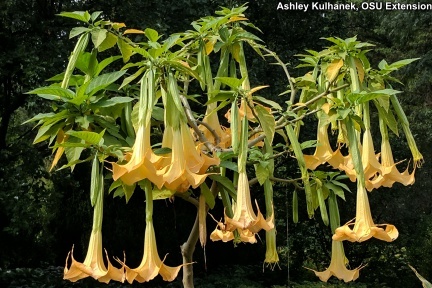 There is an International Brugmansia Society for the serious trumpeter. Or you can visit them at Kingwood Gardens as I did, where they also have a few for sale for those who need one now!